I said I might end up modelling it and I have. At 78m, Sheffield arts tower is the tallest building in Sheffield, which may be surpassed by St Pauls tower, formerly known as the City Lofts tower until the City Lofts group collapsed. 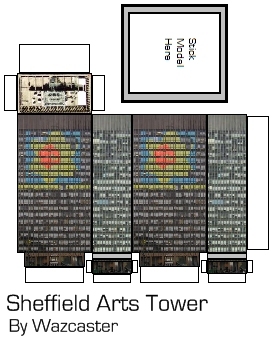 The tower is part of Sheffield university and is currently the tallest university building (and probably also the tallest educational building) in Britain. Its design was inspired by the Seagram Building in New York. Is it just me, or does the flower make it look a bit gay?